The so called “constitutional principles document” is released by Deputy Prime Minister Ali al-Selmy. This document creates a constitutional drafting committee comprised of 100 members, of whom 80 are outside Parliament, and 20 are from parties inside parliament, with a maximum of five members for each party. SCAF would select the 80 members outside parliament. The document also grants the SCAF sole right to review the military’s budget, to oversee all matters related to the military, and to approve legislation concerning the military, effectively putting SCAF outside civilian and judicial oversight. Online voting registration for Egyptian expatriates begins. The Supreme Administrative Court overturned a ruling that had barred members of the now-dissolved National Democratic Party from contesting elections. This decision freed former members of Hosni Mubarak’s political party to run in Egypt’s 2011 parliamentary elections. The ruling applies nationwide and cannot be appealed. Egyptian protest groups threatened anti-military demonstrations on Friday due to the “constitutional principles document” drafted by the interim government that was released two weeks ago, and was traced back to SCAF. A group of prominent intellectuals, including former UN nuclear weapons chief Mohamed ElBaradei, released an alternative transition plan ( to the “constitutional principles document“) which would postpone parliamentary elections and remove executive control of Egypt from the armed forces while a new constitution is drawn up. Tens of thousands of protesters gathered in Tahrir Square, demanding the resignation of Field Marshall Tantawi and insisting that SCAF turn the rule of the country over to a civilian government. Many of the protesters were Islamists organized by the Muslim Brotherhood; however there was a strong showing of the April Sixth Youth Movement who stated that they would hold a sit-in. Towards evening, when many of the protesters did not leave Tahrir Square and began setting up tents, Security forces moved in and tried to force people to return home. Security forces used tear gas and rubber bullets to try and disperse the protesters. Blogger Malek Mustafa and photojournalist Ahmed Abdel Fatah were shot in the eye. More than 5,000 protesters clashed with police again in Tahrir Square as they demanded that the military turn rule of the country over to a civilian council. Security forces struck a field clinic in Tahrir square forcing protesters to move wounded to a nearby mosque. SCAF issued a statement that it would not hand over control of the government to a civilian government until after presidential elections, which it predicted to occur in late 2012 or early 2013. Prime Minister Essam Sharaf and his cabinet submitted their resignations to SCAF, due to the violent clashes between protesters and security forces. SCAF accepted the Cabinet’s resignation but not PM Essam Sharaf’s resignation. SCAF issued a statement of regret for the loss of life and encouraged protesters to return home. Demonstrations occurred in Washington DC and New York City to protest the violence in Tahrir Square and the delay in elections, as well as the use of American made tear gas on the protesters in Tahrir Square. The street Mohamed Mahmoud turned into the front lines of the violence during the protests with a constant influx of tear gas and Molotov cocktails. During these protests, there was been a rise in sexual violence towards women. Mona el-Tahawy an Egyptian journalist was sexually assaulted, In an interview, she stated that this showed that there were more than just political problems in Egypt that needed to be solved. SCAF offered to move elections up to June 2012, but spokespersons for the protesters refused. SCAF offered apologies for the deaths of approximately 40 protesters over the five days of protests centered around Tahrir Square. Field Marshal Tantawi appointed Kamal Ganzori as the new Prime Minister, provoking public outcry. Ganzori was a former Mubarak regime PM from 1996 to 1999. Anti-SCAF protests were held in Cairo, Alexandria, the Suez and Ismailia. Pro-SCAF demonstrations took place in the Cairo neighborhood Abassiya. Protesters in Tahrir Square claimed that they wanted to establish a “National Salvation Cabinet,” to include ElBaradei, Abu El Fatouh, Sabhi and Hossam Eissa. The White House Office of the Press Secretary released a statement condemning the use of violence to quell the protests and turging a transition to a civilian Egyptian government. 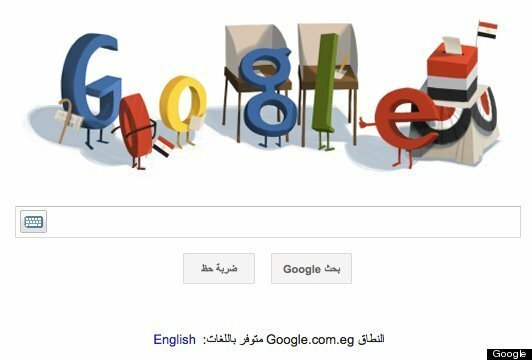 Google's home page celebrated the Egyptian elections. Egypt’s national elections are held. After a week of violent protests, the elections were surprisingly peaceful with a large turnout at the polls. Despite rules stating that there was to be no campaigning at the polling stations, candidates did so anyway. Muslim Brotherhood candidates were especially well-organized. The elections for parliament were staggered, withthe goal of having final results by January 13, 2012. Polls indicated a strong showing by the Muslim Brotherhood from the start, Many Egyptians said they felt positive towards the Muslim Brotherhood and hoped the party would win the majority of seats. However there were many, particularly the Coptic Christians, who expressed concern about to what it would mean for the future of Egypt should the Islamists win. Members of the Muslim Brotherhood guarded the polling stations throughout the night. Day two of the Egyptian Elections continued peacefully. Essam el-Erian, a leader in the Muslim Brotherhood’s Freedom and Justice party challenged SCAF, saying that the large turn out of voters meant that the Egyptian people wanted a civilian government and not a strong military presence in the government. Preliminary results of the elections, with only 1/3 of Egyptian provinces having voted, showed the the Muslim Brotherhood at 40 percent and the Salafist movements at 25 percent, with revolutionary parties trailing at only about 22 percent.